I am so excited to do my first monthly favorites post! This month all my favorites are cruelty free! Generally, I like to do detailed and in-depth posts about products that I love, but I hope you enjoy these quick and to-the-point posts! As always, any comments or questions are highly appreciated. My first favorite is from Blissoma Solutions. A great brand with a great mission delivering RAW, holistic, and vegan beauty products. I got the Rejvenating Herbal Gel Cleanser and Makeup Remover from the September Petit Vour box, and I am so happy that I did!!! This foam free cleanser is amazing at cleansing, and removing waterproof makeup, even though it feels different than the soapy, drying cleansers I've used in the past. I apply 3 pumps to my makeup'd face every evening in the shower, and all my makeup washes away without leaving my skin ultra tight -- thanks to it's sud-free formula. I also really appreciate how this brand offers paraben and pthalate free products! Available on petitvour.com or blissoma.com. 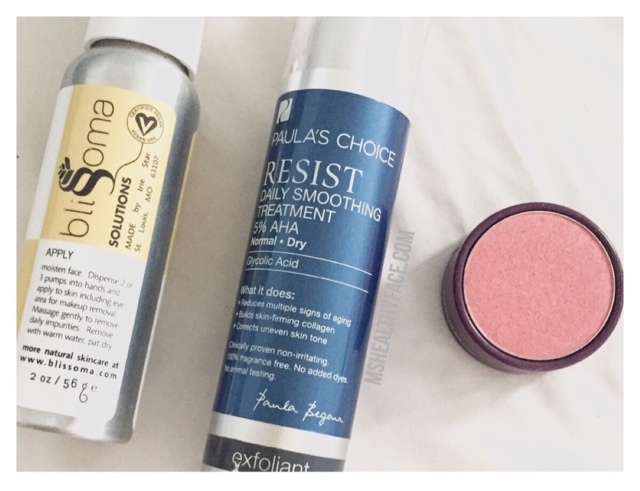 My next favorite product this month comes from Paula's Choice, the beauty brand behind Beautypedia -- one of my favorite resources for beauty reviews. After a couple months of being pimple free, I started experiencing a more breakouts, and so I wanted to incorporate a chemical exfoliant into my AM skincare routine. I ordered the RESIST Daily Smoothing Face Exfoliant from the PC website (they always have a deal going on). The RESIST Exfoliant has 5% alpha hydroxy acids, 5% glycolic acid, and a little boost of .05% salicyclic acid (BHA) so it's anti-aging and anti-acne. The formula is gentle and does not dry out or make my skin peel. I think it has added to my skincare routine and have experienced almost no more breakouts since incorporating it. My skin looks more even, and my pores appear smaller than it did a few months prior. It's suitable for all skin types. Love this one! My final favorite for September is my most favorite blush of the moment. It was a sample I was gifted from Sweet Leilani -- a Canadian, vegan beauty brand. I absolutely fell head over heels for Colour Tides blusher in 'Star Fish'. It's a coral-y blush with subtle reflects. It reminds me so much of the Milani baked blushes because of its all-in-one ability to blush, sculpt, and highlight in one motion. The slight shimmer really highlights my cheekbones. It is very pigmented, and super blendable. The 'Star Fish' coral shade is great with almost every sky tone, too. All Sweet Leilani products are made with rose hip seed oil, grape seed oil, and green tea. Definitely recommended! What's your favorite cruelty free brand or product? Paula's Choice RESIST Daily Smoothing Face Exfoliant - Water (Aqua), Glycolic Acid (AHA exfoliant), Cetyl Alcohol (thickener), Butylene Glycol (slip agent and penetration enhancer), Dimethicone (silicone slip agents/texture enhancer), Polyacrylamide (film-forming agent), PPG-14 Butyl Ether (thickener), Palmitoyl Hexapeptide-12 (cell communicating ingredient), Ceramide NG (skin identical ingredient), Tetrahydrodiferuloylmethane, Tetrahydrodemethoxydiferuloylmethane, Tetrahydrobisdemethoxydiferuloylmethane (anti-irritants/antioxidants derived from curcumin), Epigallocatechin Gallate (antioxidant), Salicylic Acid (BHA exfoliant/anti-irritant), Disodium Lauriminodipropionate Tocopheryl Phosphates (vitamin e based antioxidant), PEG-10 Phytosterol, Cucumis Melo (Melon Fruit Extract (antioxidant), Bisabolol (anti-irritant), Allantoin (anti-irritant), Cyclopentasiloxane, Cyclohexasiloxane, Dimethiconol (silicone slip agents/texture enhancers), Tribehenin (texture enhancer), Polysorbate 20 (emulsifier), C12-15 Alkyl Benzoate, PEG-40 Stearate, Sorbitan Stearate (thickeners), PVM/MA Decadiene Crosspolymer, Disodium EDTA (stabilizer), C13-14 Isoparaffin (solvent), Laureth-7 (emulsifier), Sodium Hydroxide (pH adjuster), Caprylyl Glycol (preservative), Ethylhexylglycerin (skin conditioning agent), Hexylene Glycol (solvent), Phenoxyethanol (preservative). 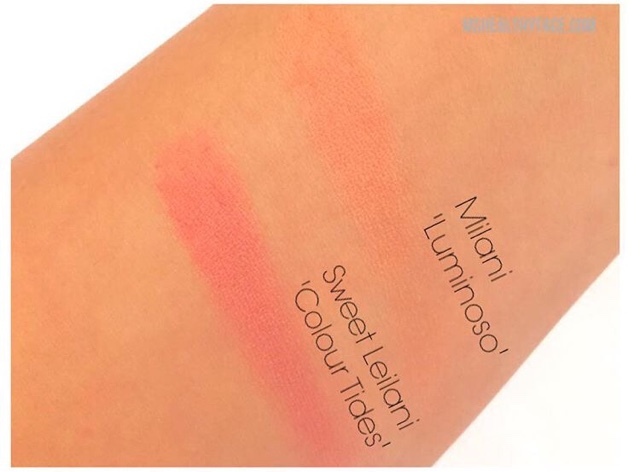 Sweet Leilani Colour Tide Blusher 'Star Fish' - Mica CI 77019,Titanium Dioxide CI 77891, Magnesium Stearate, Lauroyl Lysine, Kaolin China Clay,Golden Seal Root Extract, Vitis Vinefera (Grape Seed) Extract,Rosa Canina (Rose Hip) Leaf,Camelia Oleifera (Green Tea)Extract. May Contain Iron Oxides CI 77491, CI 77492, CI 77499,CI 77289, CI 77288, Violet CI 77742, Ultra Marine CI 77007.